West Bengal Health Recruitment Board (WBHRB) invited applications for 2418 posts of General Duty Medical Officer (GDMO). Eligible and interested candidates can apply online to the post on or before 28 December 2016. A shout-out to all those candidates willing to join Govt. Job in the State of West Bengal as 2000+ Posts are vacant in West Bengal State. 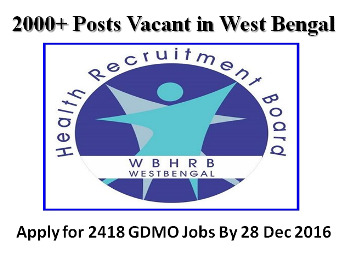 West Bengal Health Recruitment Board (WBHRB) invited applications for recruitment to 2418 posts of General Duty Medical Officer (GDMO). The eligible and interested candidates can apply online to the post in the prescribed format along with other necessary documents on or before 28 December 2016. Registration as Medical Practitioner in the Medical council of India or any state Medical Council provided that the candidates, if selected and appointed, must Register their name in the West Bengal Medical Council within Six months of joining the West Bengal Health Service. Age Limit: Not more than 32 years. (Relaxation as per categories). Eligible candidates can apply online to the West Bengal Health Recruitment Board (WBHRB) Job in the prescribed format along with necessary documents on or before 28 December 2016.